Our staff are constantly coming up with new ideas for the garden. It might be an electric composter for use on a high-rise balcony or a a new variety of hops to make our beer taste better. Over the decades we've added buildings made from clay, trees that bear rare fruit and 'green' technologies that are ahead of their time. And don't forget the birds, bees and animals who make their homes in our garden's ever changing, natural environment . Have your group arrange for a tour. Call and learn about our classes. We have tested dozens of compost bins over the years and have hands-on experience with everything from tumblers to bear proof ones. City Farmer has contributed to the world of home composting by introducing the concept of rodent-resistant bins, which simply means preventing rats from getting into your compost. You can now purchase excellent metal, wood/wire mesh, and plastic bins, to help keep rodents out. And as an extra protection, we teach residents how to trap and kill rats with simple wooden traps using chocolate from your corner store. 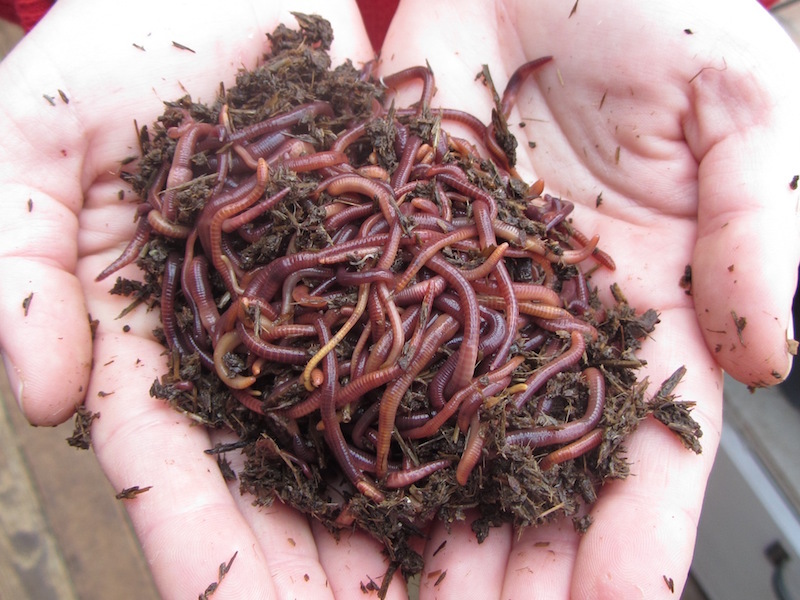 City Farmer also test worm-bins and have on display an excellent, New Zealand-made model. It is large enough to compost a family's food waste. And our worms thrive in it. Children LOVE worms and are constantly asking to hold the squirmy creatures. Our gardeners use the finished compost to fertilize the plants. Harvest from our Dwarf Apple Tree. We want people to replace their lawns with something they can eat. Our gardeners do not use pesticides and therefore we can offer people a taste of what we grow as they tour. By seeing and sampling our garden menu and learning how to use their waste to make compost, visitors leave excited by the possibilities of growing food whether they have a balcony, rooftop, or home garden space to work with. Every week throughout the growing season we take a basket or two of harvested produce to Family Place, a local charity which helps mothers and their children. They can enjoy our garden bounty which might include squashes, kale, rosemary, apples; a very long list. We grow exotic foods as well including shiitake mushrooms, wasabi, and many Asian greens. Close by we sample rare medlar fruit and sweet Spanish chestnuts, both trees that the City plants on public land. Volunteers can help us pick Saskatoon berries if they move quickly to beat the birds. Our winters are often soggy and we become tired of the rains, but when August comes we are afraid that there won’t be enough water in the City reservoirs. And therefore we are careful with the rain we get during the dry months. The garden has many features that will improve water conservation. Drip irrigation lines snake through the growing beds, rain barrels are used to wash our tools in winter, compost and leaf mulches cover the soil, and permeable paths keep rainwater in the garden so that it doesn't all flow out into the storm sewers. Rainchain downspouts frozen in winter. 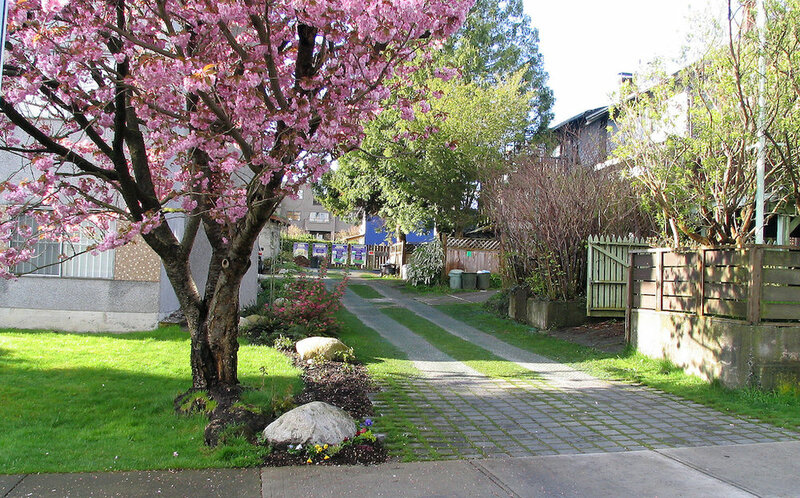 A quiet lane coming off 5th Avenue has been reconstructed using old concrete from city sidewalks, interlocking landscape pavers, and a plastic grid filled with gravel to form a 'permeable' surface, Our 'City Farmer Lane' keeps rain water in the neighbourhood instead of allowing it to travel through the storm sewers to the ocean. Plants instead of asphalt make the lane a peaceful choice for walkers. And still the lane's surface is strong enough to hold garbage trucks and fire engines. Visitors are astonished to see the variety of insect life that lives at the garden. We encourage 'bugs' by providing shelter, food and drink for them. You'll see bird baths specially made for bees to drink from. And if you see stacks of fava beans lying on the ground covered in aphids, it is because we are breeding lady bugs. Thousands will emerge and stay in our garden. Our mulberry tree leaves are used to feed the silk worms that children view at special summer classes. An empty wasp nest, that once hid in one of our bushes, now hangs under a roof so that children can see its unique construction. Our original shed is made from specially cut telephone poles. It was built be Don Ellis who for thirty years taught woodworking at a Vancouver school. These massive timbers make for very strong construction. The 'cob' (clay) tool shed was a community project involving dozens of volunteers. Clay from local road excavations was dropped off at the garden. It was mixed with straw, sand and water, and molded by hand into a Gaudí-like structure that includes a garden on its roof and a wood burning oven for cooking food. Our green, portable office was found empty on a lot across town. It was 'recycled' by the City and transported to our site. Special helical piles were drilled into the ground to create a unique foundation for our building to rest on. In spring our roof garden is all about colour. Bulbs are planted by our youngest gardeners who climb a ladder to maintain the space. For years we fertilized the rooftop soil with dry human manure from our compost toilet. When it rains, the soil on the cob shed holds the water before releasing some down chains that act as downspouts. Planting a LifeSpace self-watering raised bed. When visitors come to see us, they get to see what we use every day to do our work. That might include an oddly shaped tool to make weeding easier, a biodegradable compost bucket, a locally made self-watering garden bed or an aerator for turning compost. Where do we get our seeds, what month do we plant garlic, and how do we use our rhubarb? These are questions our staff can answer. And what we don’t know, we can find from our network, developed over many years in Vancouver. 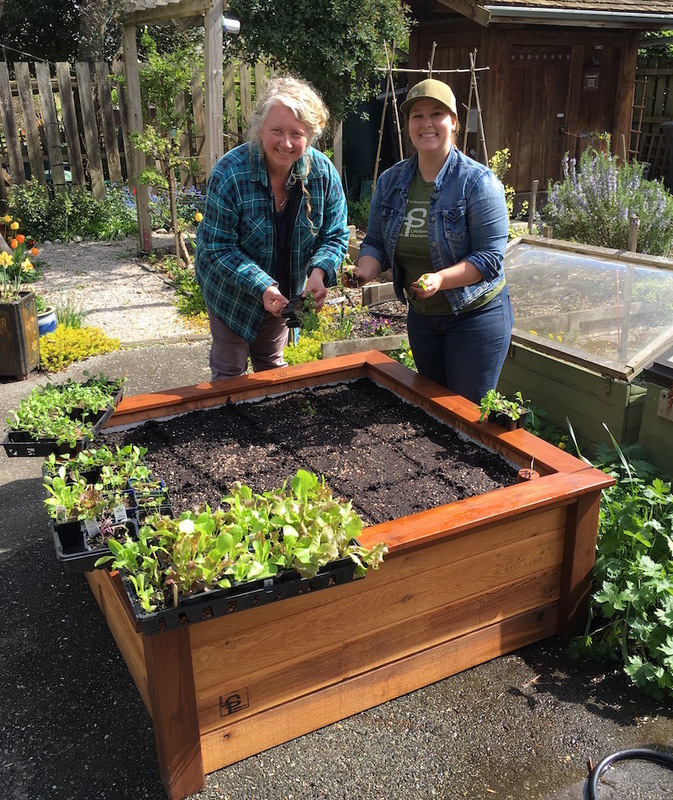 City Farmer staff include horticulturists, landscape designers, librarians, teachers, pest control experts and seat-of-the-pants local gardeners. Head gardener Sharon keeps a pair of binoculars handy to identify all the birds who enjoy the wild spaces in our organic garden. You might spot a Black-capped Chickadee nesting high up in the birdhouse atop our railway gate. Watch for Cooper's Hawks, Flickers, Anna's Hummingbirds, Red-breasted Nuthatches, Winter Wrens, Yellow Warblers, Song Sparrows, White-cowned and Golden-crowned Sparrows, Juncos, House Finches, American Goldfinches, and Spotted Towhees. In spring, they sing so loudly you'll imagine you're in the tropics. Watch them dine on a smorgasborg of seeds and insects, or construct their nests from bark stripped from a bench . You can also see works by local metal artist Davide Pan. And don't miss home-spun glass pieces embedded in the gate, a stone Inuksuk on the hill in the back garden and a fairy house made from beach shells. Roses, wisteria, trilliums, chickadees, shade, quiet, and colour, a feeling of mystery, excitement, and remoteness from everyday life – how can this not transform a visitor who has just walked in off a busy street. All our senses are engaged while in the garden, whether we are smelling an antique rose or popcorn scented plant, tasting a fresh picked asparagus stem or feeling the velvet leaf of a Lamb's-ear plant. And then you see a family of racoons scurrying by on their way to a hidden shelter in the blackberries. You can sit on a tree stump, meditate on life while the sun warms your back and you write a poem. Or help us pull up buttercups, get your hands dirty in the rich soil, and awaken your muscles.